Centennial Volunteers are people dedicated to restoring special Forest Preserve sites along the Chicago and Calumet Rivers. 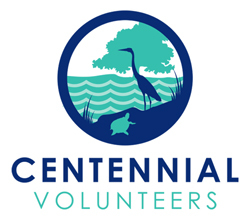 Founded in 2014, the Centennial Volunteers program is a partnership between Friends of the Chicago River, the Forest Preserves of Cook County, Friends of the Forest Preserves, and the Field Museum which encourages people to adopt a site by consistently volunteering there, and perhaps taking Forest Preserve training to act as a workday leader. The Centennial Volunteers Program just got a great write up in Chicago Life Magazine! Check it out: Page 1, Page 2, Page 3. Friends' strives to illustrate how our work impacts river habitat, so we conducted a Natural Areas Assessment. The results are impressive and show remarkable improvements in both plant quality and diversity. For example, overall % Native Plant Coverage rose 22% from 2016 to 2017 (46% to 68%) and all 9 sites improved. We are so thrilled with the improvement, Friends highlighted this project's in the 2018 Winter River Reporter. Here is an extended version of that piece, with more graphs and charts to delight the nerdy and non-nerdy river lovers alike. 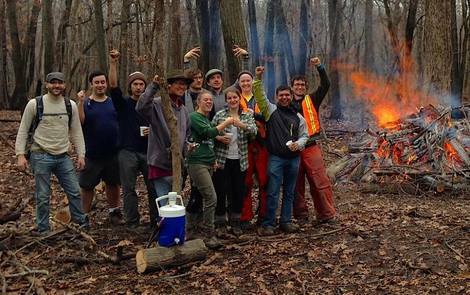 This project continues throughout 2018 with monthly volunteer opportunities to get out and have fun while really making a difference in the ecological heath of the preserves and ultimately the Chicago River system. Volunteer activities range from removing invasive vegetation, to collecting native seeds, wildlife monitoring projects, brush pile burns, and more. To learn more or sign up for a workday please click here. We are thrilled to annouce one of the original CV sites, Somme Woods, has achieved our goal of having a dedicated core of volunteers who assumed leadership of the site and now works with the Forest Preserves to conduct consistent, frequent, high-precision restoration work. It's a shining example of how deliberate and thoughtful committment from a few individuals can create a new community of volunteers. Somme Woods is a remnant oak woodland situated along the west fork of the North Branch of the Chicago River. The site is part of a larger “Somme” complex identified as a key conservation area due to the oak woodlands which contain a diversity of woody and herbaceous plants as well as a series of ephemeral wetlands important for wetland plant and animal communities. Current sites include: Beaubien Woods, Blue Star Woods, Clayton Smith Woods, Forest Glen, LaBagh Woods East, Kickapoo Woods and Prairie, River Oaks Woods, and Whistler Woods. See site descriptions below. Beaubien Woods is located along the Calumet River on the south border of Chicago. At the time of settlement it was best described as a mosaic of sand prairie, marsh, and savanna. The main work area consists of remnant marsh and former prairie. The marsh has been invaded by wetland plants that need to be reduced or removed to improve the natural plant communities there. The former prairie has had anthropogenic disturbance and activities there will revolve around removal of non-native brush. Blue Star Woods is a 20 acre site of high quality woods that includes a popular picnic area. Activities will include thinning of occasional buckthorn and other invasive trees and stormwater management. Volunteers will seed areas to stop erosion and allow oak and shrub reproduction. Clayton Smith Woods is a remnant oak woodland wedged between FPCC’s Bunker Hill and Miami Woods – two established stewardship sites that have been completely turned around by volunteers. As such it is well suited to stewardship work and would make a significant contribution to restoration along that stretch of the North Branch of the Chicago River. Forest Glen is located along the southern end of the FPCC’s properties along the North Branch of the Chicago River. It contains segments of oak woodlands that have been impacted by invasive woody plants and would benefit greatly from stewardship. It sits between LaBagh Woods and Edgebrook Woods where restoration work has been ongoing. The site is an important link in the bird migration chain along the River. 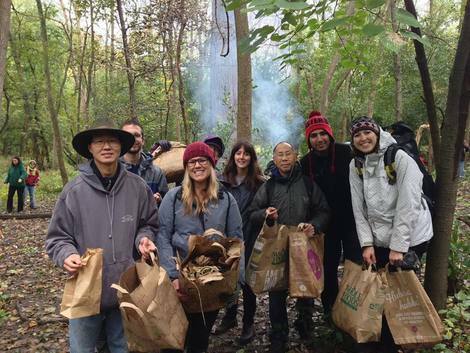 LaBagh Woods East is a popular picnic area with heavy use from underserved communities on the north side of Chicago and the near north suburbs where volunteers will thin occasional buckthorn and other woody invasives and seed parts of the 160-acre site. This work will stop topsoil erosion and allow for native oak and shrub reproduction across 10 acres at the site, as well as stabilizing an additional acre of bluff and streambank. As a wooded riparian strip surrounded by dense urban development, it is widely recognized as one of the most important refuges for migrating birds in Chicago. It also hosts breeding birds as well as winter residents. A known birding “hot spot”, it boasts 174 species overall, with 158 having been seen so far in 2015 alone. Kickapoo Woods and Prairie, located in south suburban Riverdale, sits along the banks of the Little Calumet River. The work at this site will enhance the restoration of an existing remnant prairie along the east side of the site and complete the restoration of the oak savanna and upland prairie covering the remainder of the site. The restoration footprint is approximately 50 acres. River Oaks Woods parcel sits in the glacial Lake Chicago Basin and was once part of the large dune and swale complex that cut across this region south of Chicago. It is underlain with sandy soils and contains characteristic black oak savanna plant communities that are a hybrid of wet and dry sand prairie as well as sand savanna. The site is along the Little Calumet River, a little north of the junction with Thorn Creek and as such is an important connector between the FPCC lands clustered along Thorn Creek and those along the Calumet River system. It has been invaded by buckthorn and oriental bittersweet and is in need of and is well suited to stewardship work. Whistler Woods is a 20 acre site in the Calumet region that is heavily used for recreation and includes tremendous opportunities for invasive removal. This site is a focal point on the FPCC holdings in the Calumet region and offers potential as a demonstration site to showcase this type of work. To get involved, please contact Annette Anderson at (312) 939-0490, ext. 14.